Welcome to issue 24 of the Frontier Explorer. 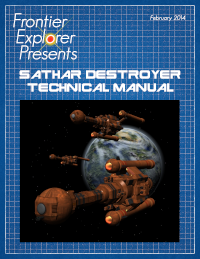 Now that Spacefleet has cleared out the recent sathar incursion, we can start publishing again. This issue picks up right where we left off including some articles that were ready to go but didn’t make it into issue 23. All of the usual articles (Jurak Hangna, comics, etc) are here along with articles about derlict spaceships, and some not so derelict ones along with an small mini adventure in our Warriors of White Light 2 series. The biggest change is that we’ve moved to a new layout and design for the magazine’s cover, logo, and interior. Let us know what you think about the changes and any suggestions or ideas you might have to make it even better. This issue continues and strengthens our support for the FrontierSpace RPG in addition to Star Frontiers. Issue 23 had a conversion of the Star Frontier races to FrontierSpace. This issue contains the details of a star system from the FrontierSpace frontier sector as well as stats in the Jurak Hangna creature article for use in that system. Grab your copy today and as always, keep exploring! I finally got the Pursale ship deck sketches up last week but then got completely distracted by a number of other things. One of those was the decision to write up my concept for a complete “zero-to-hero” style Star Frontiers campaign that takes the characters from starting PCs to major players in the Frontier with high level spaceship skills that uses all the published modules. The first of those posts will be next week. While working on that, I talk about the space battle around Volturnus at the end of the first 3 modules. The modules hand wave it away as, at the time, the spaceship rules weren’t published so there was no way to run it. In this post, we’ll look at my concept for that battle. What sathar ships are there, and what the UPF sends to the fight. If you read my Detailed Frontier Timeline posts, you know the answers as this has already been covered in the posts there, but I thought I’d lay out some of the rationale behind the decisions and set the game up for an epic Knight Hawks board game battle. And I’ll tell you how it played out when I ran through the scenario to generate the timeline posts. In my universe, all the sathar ships of destroyer size or larger are also troop transports. While the UPF tend to have small crews and lots of allocated space, the sathar pack in lots of ground troops on to each ship. 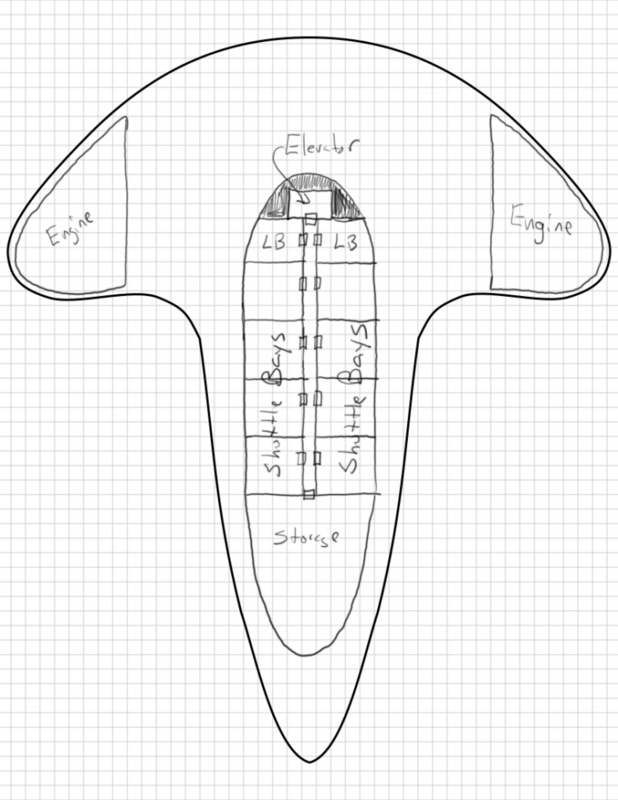 You can see an example (and more detailed explanation) of this in my Sathar Destroyer Technical Manual (link goes to product page on DriveThruRPG – it’s a free product) that details the interior of a sathar destroyer. That ship carries over 500 ground troops packed into its bowels. Based on the ship sizes, I’ve extrapolated that the light cruisers carry about 4,500 troops, the heavy cruisers carry over 15,000 and the assault carriers transport around 10,000 troops in addition to up to 12 fighters. While I haven’t completely fleshed out those larger vessels, this is a close enough estimate for this article. Now that we know how many troops each ship transports, we can come up with a reasonable composition for the invasion fleet that is attacking Volturnus. This tells us that there are at least 30,000 troops on the ground and that there were more to begin with as many were destroyed in the landing attempt. This gives me a total troop compliment of about 52,000 troops plus robots, attack creatures, and heavy weapons. We can assume that about 40% of the troops were killed by the planetary defense system leaving about 30,000 for the assault on Volkos. We have to remember that this is not a planned engagement in an on-going war. Rather it is a sudden call to arms that has to be filled in at short notice with no idea of what the opposing force will be. In fact, given the overwhelming number of ships that were seen at Pale 50-60 years earlier (in my history), the UPF might be loathe to commit any ships fearing that they are sending them into a deathtrap. Regardless, the ships are sent, but they are assembled on short notice. The most obviously available ships are the Pale militia ships, consisting of a frigate and three assault scouts. They would almost certainly be pressed into service by Spacefleet as they are only one jump away. If Laco (in Dixon’s Star) had a militia, they too would probably have been involved but Laco is only an outpost. Streel is headquartered on Pale, and it is almost certain that they have a number of military or paramilitary vessels at their disposal. They might be conscripted by Spacefleet or possibly even volunteered as Streel has a definite interest in opening (and exploiting) Volturnus. Keeping the sathar out of the system and off the planet is just good business practice. So Streel will probably send some ships along. That leaves Spacefleet. Strike Force Nova might be around. It patrols around the Frontier constantly so there is a chance it is nearby. The nearest large group of ships with a known location is Task Force Prenglar, stationed in its namesake system. The problem is that it’s three systems away from Zebulon. Which means it’s going to take some time to get there and may not arrive in time. If you just use the distances between the stars as travel time, it’s only 15 days. That’s they way the Alpha Dawn rules described interstellar travel. However, the Knight Hawks rules say you have to accelerate up to 1% the speed of light to make the jump and then slow down at your destination. That acceleration, at 1g takes a little over 83 hours or just over 4 days. And then 4 days to slow down. Assuming some maneuvering at the beginning and ending of the trip and checking vectors and such just before Void entry, a single interstellar hop really takes about 9 days, regardless of distance. Maybe a bit longer on long jumps due to extra astrogation calculation time. Now we can speed this up a bit by accelerating faster but for a long transit, that has detrimental effects on crew. If you expect to be coming out of the Void into a firefight, you don’t want to have spent the last two weeks strapped into an acceleration chair at 2-3 gees. We can also speed up the transit by not slowing down in the intermediate systems. Then we only have the astrogation time to worry about. That might work for the Dixon’s Star system, but they will have to slow down in Truane’s Star to rendezvous with the ships from that system and coordinate their jump. So assuming ships from Prenglar blow through Dixon’s Star without stopping it will take them 4.5 days to get to Void speed in Prenglar, 2.5 days in Dixon’s Star to do the astrogation calculations, 4.5 days to slow down at Pale in the Truane’s Star system. Then they need to accelerate and jump to Zebulon which will take another 9 days. All told, that’s 20.5 days of travel. Add to that any time it takes to assemble the Task Force and get the ships ready to leave. What other options are there? In the description of Spacefleet, it describes the two Task Forces and Strike Force Nova and then says that there are other smaller units as well. I decided to take advantage of this. At the same time as the events are unfolding on Volturnus, Streel and Pan Galactic are locked into what will be known as Laco’s War, the first corporate war. In my games, this war is just starting to heat up. Because of that, Spacefleet had recently dispatched a medium sized Patrol Group to the system to attempt put a damper on the rising hostilities. Patrol Group Virgo, consisting of 2 light cruisers, 2 destroyers, 2 assault scouts, and an assault carrier with 8 fighters, has just recently arrived in Dixon’s Star. That puts them marginally closer only requiring 18 days to get to Volturnus with the advantage that since they are already out on patrol, they can depart immediately. From a campaign perspective, I have the UPF fleet arrive just as the battle on the ground is ending, driving off the sathar ships. We now have the order of battle. The sides are fairly evenly matched. The UPF fleet has more ships, but the sathar have slightly more hull points. The UPF’s forces are concentrated into its smaller vessels, lots of little assault scouts and corvettes that can potentially be picked off fairly easily. This scenario can be played by any number of people. Simply divide into teams and each team takes a side. The UPF forces divide fairly easily into three groups, one playing the UPF ships, one the Pale militia, and one the Streel ships. Although the number of ships and their strength isn’t evenly distributed between those groups. The sathar ships can be divided up any way that team sees fit. A planet counter representing Volturnus is placed in the center of the map. The sathar are the defenders in this scenario. Sathar ships, with the exception of the frigates, are all placed in orbit around Volturnus with a speed of zero. They have just recently finished dropping off all their troops. Since the frigates are not troop carriers, they can start in any hex within 5 hexes of the planet with a speed of up to 5 hexes/turn. The UPF are the attackers. They all start along one of the short sides of the map. The individual ships can be anywhere on that side, but all the ships have to be on the same side. They must start within 3 hexes of the map edge and be moving at any speed up to 15 hexes/turn. All the UPF ships have to start at the same speed. A ship is considered to have escaped from battle if it moves off any edge of the map with a) no ships in pursuit, or b) is out of weapon range and has a higher ADF of any pursuing ships. Heavy cruisers and assault carriers are important vessels in the sathar navy. If the tide of battle seems to be going against the sathar, they will try to pull back to preserve these larger vessels, sacrificing the smaller ones if necessary (even if it means ramming) to delay the UPF ships and allow the larger vessels to escape. The sathar claim victory if they can destroy all the UPF vessels. The UPF claim a complete victory if all the sathar vessels are destroyed. If any of the sathar vessels escape, it is only a partial victory. I played this out once using the full Advanced Combat rules of the Knight Hawks boardgame. I wanted to test the plausibility of this mix of ships in the scenario. Basically I was playing to make sure it was possible for the UPF to win. I definitely thought the sathar would have the advantage. It turned into quite the slugfest. However, the UPF got in some lucky early blows with the assault scouts living up to their hype and taking out nearly half of the sathar fleet by round 3 of the game after losing only a single assault scout. In the end, the sathar fleet was routed, escaping with only 1 frigate, 2 destroyers, and a heavy cruiser. The other heavy cruiser and assault carrier were lost on that fateful round 3. The UPF only lost a Pale militia assault scout, and a light cruiser and assault scout from the Spacefleet contingent, but almost no ship escaped unscathed. The die rolls favored the UPF and it ended up being a very lopsided game. I suspect if played through several more times, it could go either way. Do you like these Knight Hawks game scenarios? Would you like to see more of them? Should I include the statistics for the ships? If you play this scenario out, let me know which rule set you used (Basic or Advanced) and how it turned out. It’s taken me a long time to get to this point but I finally have sketches of the ship embedded in the center of the Outpost Osiris asteroid. These are my initial roughs that I will fill in with details as I complete the write-ups. The scale on the images is 5 meters to the square. This ship is quite large with a “wingspan” of nearly 200m and a length of over 300m. It consists of five decks each of various sizes. 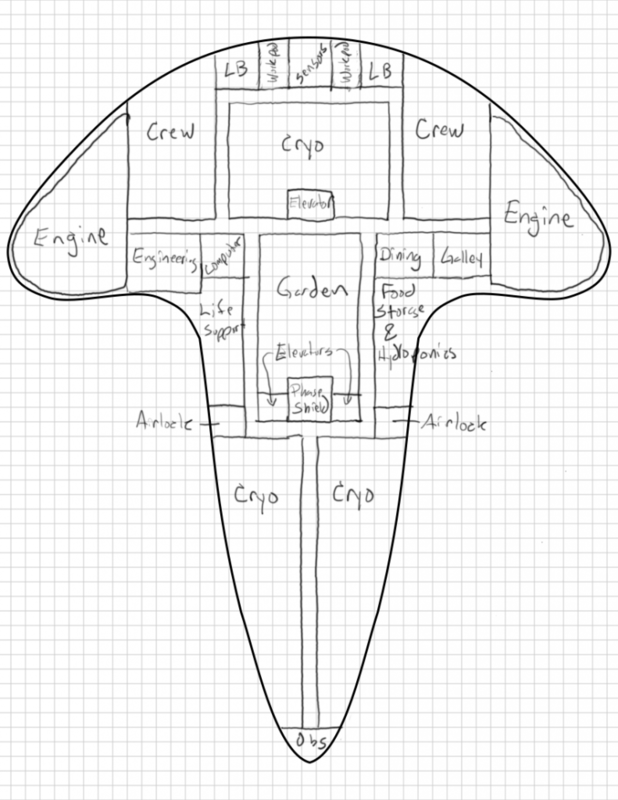 I’m going to try to do a 3D render of the shape of the ship at some point. The bold outer outline in each of the following images represents the outer hull of the middle deck (deck 3). It is shown on each of the images to allow you to compare the other decks to the overall size of the ship. Only parts of the ship are going to be physically accessible in the module. Other parts are fused with the rock of the asteroid or crystalline structures piercing through the body of the ship in the central cavity of the asteroid. I’ll be deciding exactly what is obstructed and what isn’t as I work on the module details. I know for sure that the engines are not accessible and that the phase shield room (deck 3) and power core (deck 4) are undamaged as is the starboard airlock. Some of the robot storage areas will be accessible as will at least one cryo bay (so the characters can find some desiccated Pursale remains) but beyond that, I haven’t decided what to make accessible. That will come at a future date. So here are the five decks of the ship, from bottom to top. This deck primarily contains 8 shuttle bays, a storage area, and the ship’s two underbelly laser batteries. The large engines out on the wings also extend down to this part of the ship but are not accessible from here. The large storage area here contained colonization supplies. This deck has another large storage area for colonization supplies, as well as the robot storage areas and a tech shop. There are also two more shuttle bays on this level as well as the first of many cryo bays containing rows and rows of the (once) frozen colonists. This is the largest deck of the ship. It contains the engineering section, access to the engines and the crew quarters for the active crew. 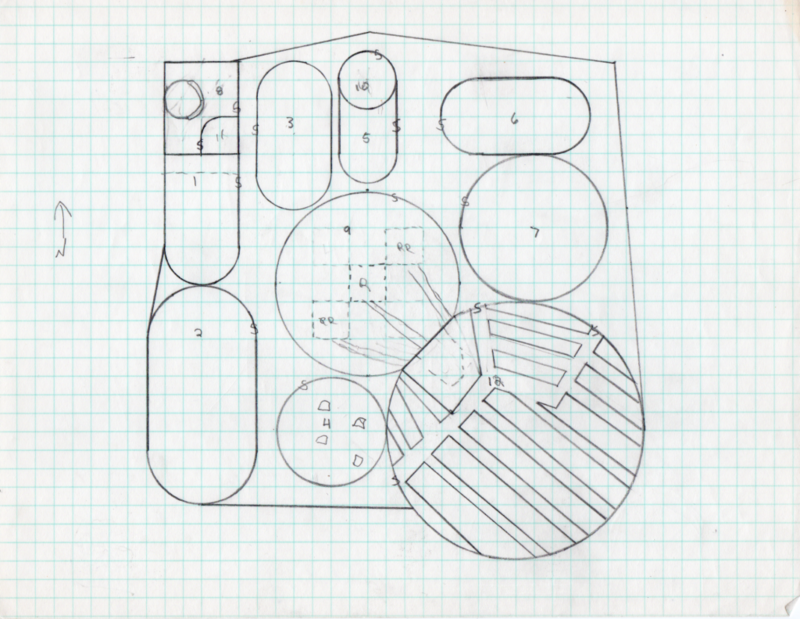 There is a large garden area, dining an food storage, as well as several cryo chambers. There is also an aft observation deck, forward sensors, and the ships two forward facing laser batteries. The airlocks are also on this level as are some of the ship’s workpods. The phase shield generator is located on this deck in the very center of the ship. 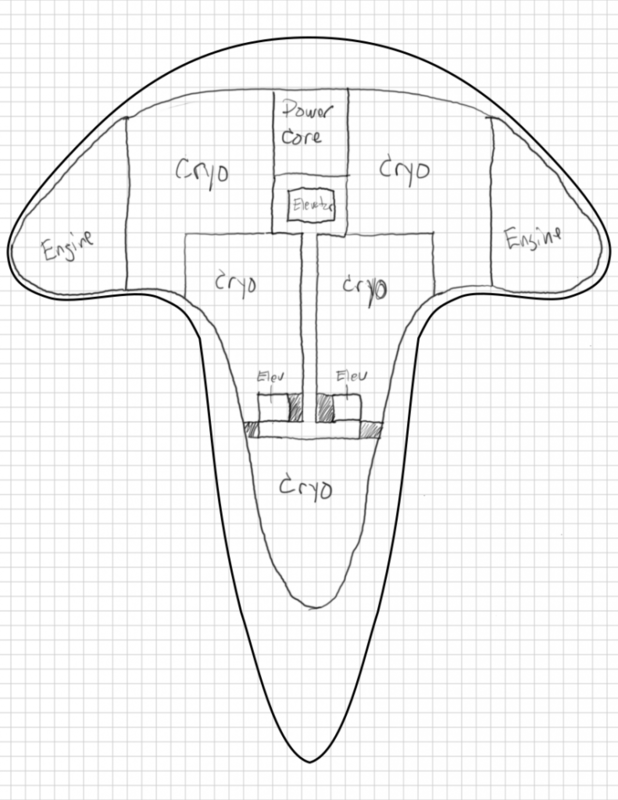 This deck consists almost completely of cryo storage bays containing colonists in frozen storage. The only other ship system on this level is the ship’s power core, which amazingly wasn’t destroyed when the ship unphased into the asteroid. This deck contains the ship’s bridge and medical facilities, a few more smaller cryo bays, as well as the ship’s launches and some more workpods. It also has the upper laser battery. 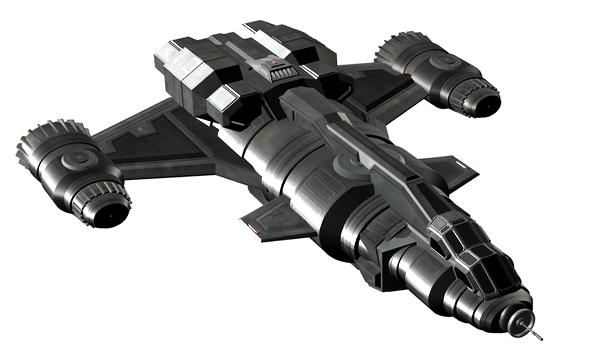 This is the ship as built when fleeing the Pursale homeworld and fully functional. By the time the PCs discover it, it has been embedded in the asteroid of millenia. Many of the parts of the ship are fused with either the rocks of the asteroid or crystalline structures in the central cavity. All of the crew and colonists are long dead however some of the robots, along with some parts of the ship’s machinery has survived. The next step is to figure out which parts of the ship are still accessible and create the actual maps for the game along with the description of the various areas. The intention of this part of the adventure is for the players to make their way onto the ship, overcoming the last of the ship’s defenses, and attempt to obtain the phase shield generator off the ship and install it on their own. They then need to feel the outpost as their tampering has caused the ship’s power core to enter a self-destruct mode that cannot be stopped. The details of the ship are still fairly malleable so let me know if there are any major ship systems or details that you think I missed. I had used the wrong scale grid when building the original sketches. 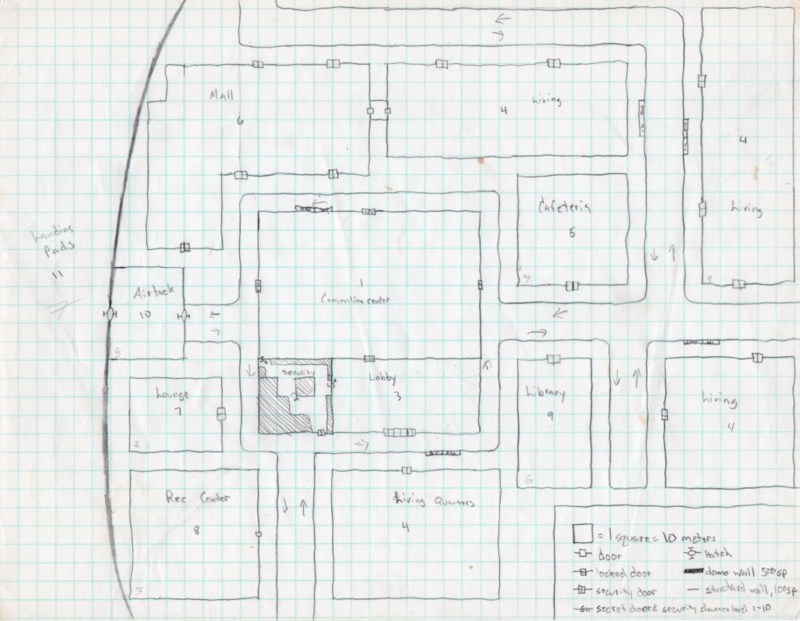 Interestingly enough when I applied the correct grid to the maps, all the corridors I had free-handed in that were off the original, wrong grid, matched up almost perfectly with the correct grid. I guess subconsciously I knew there was something wrong. I forgot a few fairly important parts of the ship, for example airlocks. That means I need to rework the sketches before they are ready to present. That’s this week’s project. In the mean time, I rooted around in my old folders and found some old location maps that I drew way back in the late 80’s as a teenager when I was actively playing Star Frontiers in high school. I’d probably draw them differently now, but they definitely hold a bit of nostalgia. I’m presenting them in this post as-is. 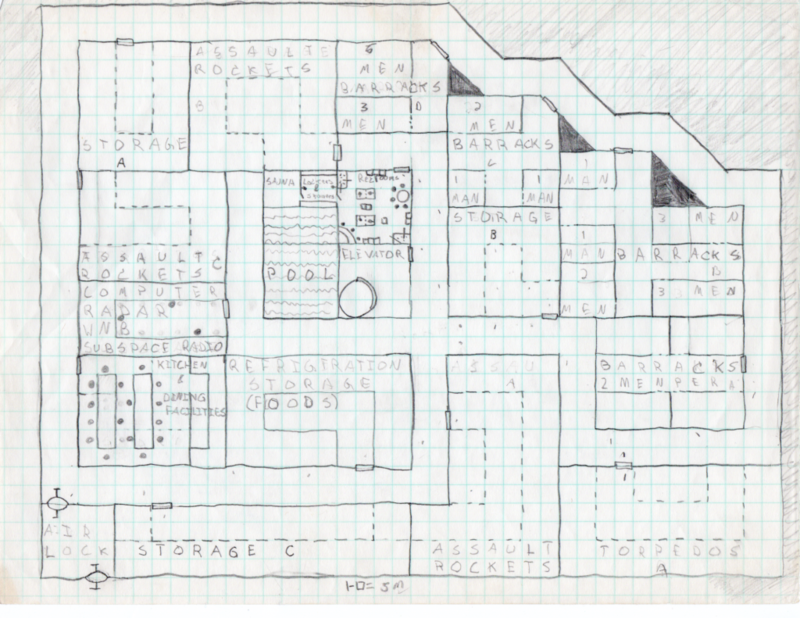 These are simply scans of the original hand-drawn maps that were created on 8.5×11 quad-ruled graph paper. (I even think I still have some of the original pads as I bought a big box of them back in the day.) I’ll be providing a little bit of commentary but not much. I actually have write-ups for some of them but I’ll hold that for a later post when I have a chance to review them and update them to remove any glaring errors I made as a teenager when I first concocted them. For all of the images, you can click on them to get the full 200dpi resolution version (each one is about 5 MB in size). This one is a portion of a large area map. It is inside a clear, domed area which I think was supposed to be on an asteroid or moon but given the layout, needs some significant gravity. This location is the basis of a murder mystery adventure. I’ll definitely be updating and writing this one up at some point in the future. This location consists of three maps, and as far as I can tell, I don’t have any sort of write-up for this one. Although it is supposed to be in an asteroid. Probably inspired by the idea of the Planaron pirate base from Warrior of White Light. Do with it as you will. This is the main level with the main entrance via the airlock in the lower left. I think this one has some serious scale issues. According to the scale at the bottom, one square is 10 meters. Which makes those passages large enough to drive trucks down. It probably should be 2m per square. The pirate officers have an assault scout stashed away in a hidden bunker. That ship is 21.5 squares long which gives more credence to the 1 square is 2m scale hypothesis. I vaguely remember painstakingly drawing that assault scout based on the image on the little Knight Hawks chit. Our last location is a set of two maps detailing a sathar training base. I’m pretty sure this one was inspired by the sathar training base in the Sundown on Starmist module. I have a write-up for this one as well that I will post in the future once I’ve had a chance to review it. This is nestled in a forested area and has a number of features that stick up through the trees. 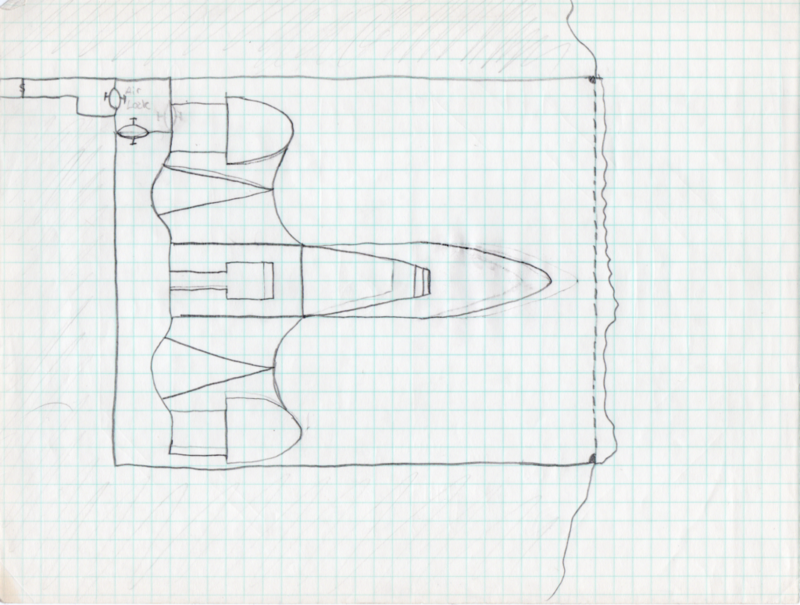 I was also inspired to draw a profile view (lower right) that is looking from the bottom of the map towards the top. This is the actual base and built completely underground. The defense turret is automated and has a magazine that feeds the rocket launcher and recoilless rifles mounted on the defense dome. I have several other maps of other locations I developed back in the day, and even more recently. There are only one or two of the older ones that I would consider useful. Most of them were way too far fetched and fantastical for any game I’d run today but I guess made sense to my teen-aged self. I hope you enjoyed this little walk down memory lane with me. Let me know what you think of these maps and which if any you’d like to see detailed out first. 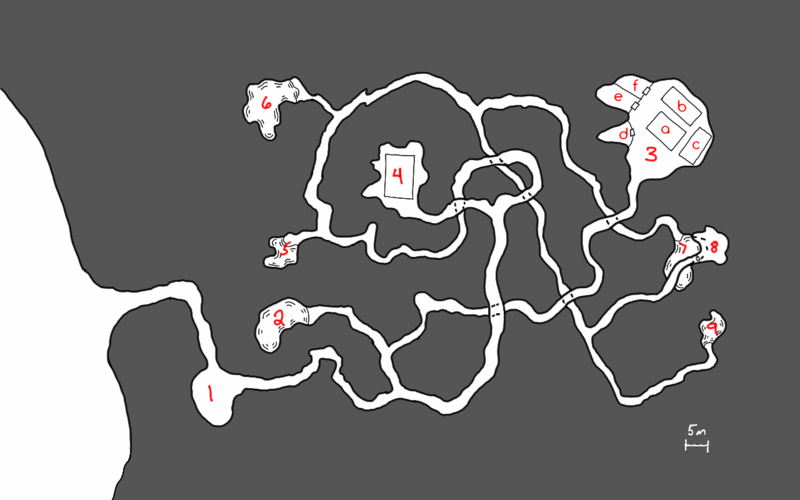 Feel free to use these maps in your own games if you want. 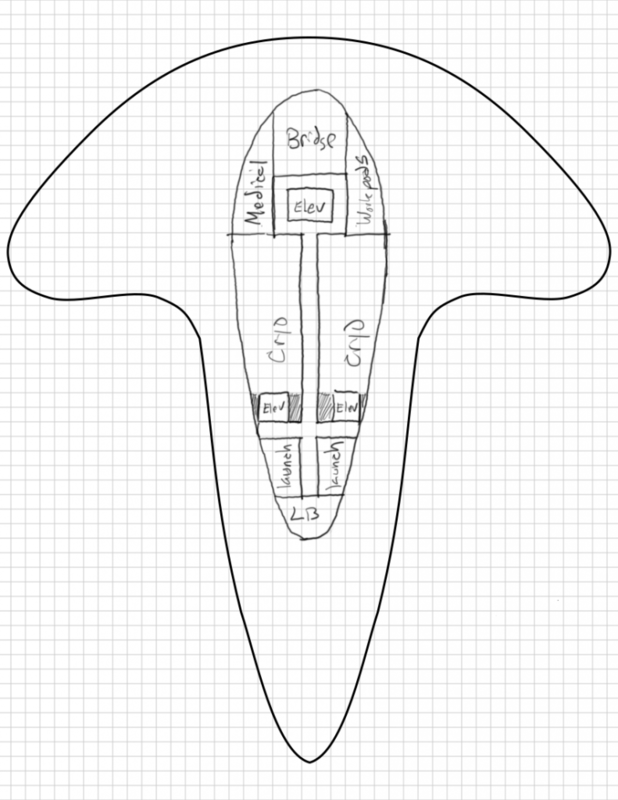 In the mean time, I need to get back to working on the alien ship for the Ghost Ship Osiris module. See you next week. Here is the next set of entries in the detailed Frontier timeline. This month includes the beginning of the events in the Sundown on Starmist module, the beginning of the final campaign of the sathar against the saurians in the their corner of space, as well as the commencement of hostilities by sathar agents against military targets throughout the Frontier. 60.054 Waiting for decisions from the Council of Worlds and Spacefleet, PGC dispatches several vessels from Gran Quivera (Prenglar) to Dixon’s Star to serve as a corporate militia in the system. 60.055 Sathar SCC#3, near Kizk-Kar, completes production of a frigate. 60.056 The small raid (1 LC, 2DD) launched by Clan Z arrives in Kizk-Kar system. With SF Nova in system, the UPF ships soundly defeat the sathar ships in the first official battle of what will come to be called the Second Sathar War. SF Nova extends its stay in the system for an extra 7 days. 60.057 Council of Worlds envoys arrive at Volturnus (Zebulon) to meet with leaders of the various native races. * News of the failed raid on Kisk-Kar reaches sathar space. The premature action and its failure curries disfavor and Clan Z falls out of favor, losing any chance to leading the attack on the Frontier. 60.059 Careful examination of the Eorna eggs has determined that they are, in fact, viable. Eorna on Volturnus (Zebulon) celebrate and declare the day of discovery to be known as the Day of Life to be remembered just as the Day of Doom. 60.060 Members of the Second Volturnus Expedition depart Volturnus to return to Pale. 60.061 Sathar SCC in the Liberty system completes construction of half a dozen fighters. 60.062 Rim Coalition delegation arrives at Gran Quivera (Prenglar). 60.063 Sathar vessels from the Liberty system arrive at the staging area to await assignments. 60.064 Rim delegation begins meeting with the Council of Worlds to discuss the sathar situation and the mutual defense of the Frontier and Rim. 60.065 * Supplies intended for Fortress Kdikit in Madderly’s Star are stolen/destroyed by pirates while in route to the construction site. * SF Nova departs Kisk-Kar for the K’aken-Kar system. 60.066 After several space battles, sathar forces overcome the saurian defenses in the Dayzer system and bombard New Kischen (FE004) obliterating the saurian settlements on the planet. 60.067 The first of Spacefleet’s Talnor-D (FE004) communication ships, the UPFS Nexus, emerges from the shipyard at Gran Quivera (Prenglar). It begins a 30-day shakedown cruise with Task Force Prenglar. 60.068 Sathar forces in the Tischen system finally overcome the saurian defense forces and launch a planetary bombardment of Kzz-ten (FE004) destroying the settlements on that planet. The defense of both the Tischen and Dayzer systems have put a serious dent in the sathar resources for the campaign, buying the saurians some time to bolster Sauria’s (FE004) defenses and work to complete the Great Ark project. 60.069 Second Volturnus Expedition members arrive back at Pale to a hero’s welcome and receive recognition for their work in repelling the sathar attacks in that system. 60.070 * Sathar agents in the Frontier begin stepping up activities, especially focused on military and technological sabotage. * An anti-Streel group, funded by sathar agents, strike at the Streel SCC around Pale, reducing capacity by 63% while repairs are made. Several ships under construction are damaged but the militia Assault Scout miraculously escapes unscathed. 60.071 Two small flights of three Saurian Battle Rays (FE004) each are dispatched to investigate the state of the Tischen and Dayzer systems and determine the strength of sathar forces. 60.072 CEO of Streel, Hilo Headrow (ZG) signs deal with his friend from the Great Sathar War, Esper Henshaw (ZG), CEO of MerCo, for MerCo to supply several teams to increase the security at the Streel starship construction center orbiting Pale (Truane’s Star) while Streel investigates the source of the recent attack. 60.073 SF Nova arrives in the K’aken-Kar system and will remain in system for 8 days. 60.074 Initial damage assessment of the Pale (Truane’s Star) starship construction center reveals that the damage was not as extensive as originally thought. Materials and equipment shuttled up from the surface quickly bring production capacity back to 58%. Work begins to restore full capacity. 60.075 A mountaineering survival team, calling themselves the Spire Dragons, begin their attempt to traverse coast to summit and climb Mt. Spire (Lossend, Timeon) (ZG) completely on foot. The team consists of members of all seven Frontier and Rim species with the goal that a member of each species will reach the top of the Frontier’s highest peak. 60.076 Medical Services Organization issues another alert about the drug Ixiol, stating that the use of the drug on Triad (Cassidine) has reached dangerous levels and is impacting work and economic activity on the planet. They call for the Council of Worlds and Star Law to investigate the production and trade of the drug. 60.077 * An independent freighter in the Gruna Garu system claims sighting of an unknown vessel, roughly the size of a light cruiser bearing UPF markings but not matching any known UPF vessel type. * Spacefleet dismisses the sighting as inaccurate claiming no vessel of that type in its inventory and dispatch a small patrol group (a frigate and 2 assault scouts) from Prenglar to investigate. 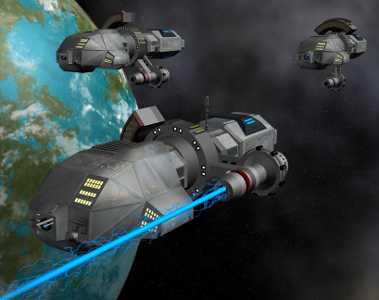 * Sathar reinforcements arrive in the Tischen system. 60.080 * Sathar reinforcements arrive in the Dayzer system. * Saurian scout ships arrive in the Tischen and Dayzer systems and begin to probe the systems while avoiding sathar forces. 60.081 SF Nova departs K’aken-Kar for the K’tsa-Kar system. 60.082 After months of fundraising, a new organization, The Yazira Heritage Foundation, purchases and begins refitting a small vessel to use as an exploration ship. Their goal is to reach the star that rumors claim is Yazira. 60.083 Sathar launch a probing raid into the Sauria system to test saurian defenses. The two-destroyer task force is quickly destroyed by a wing of saurian Battle Rays. This post should have come out yesterday but life has been quite crazy for me the last few days (and weeks really). For the most part I accomplished everything I set out to do. I got the Sathar Cave System and Hum Calendar published as well as the updated engine data for the new starship construction system. What I didn’t get to at all, once, again, is the Pursale ship for the Ghost Ship Osiris module. 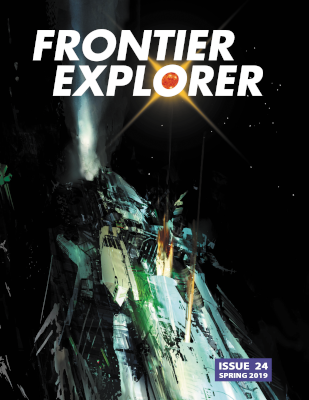 Most of my spare time this last month was eaten up by working on the Frontier Explorer. So much so that my buffer of articles has been completely used up and I’m writing this one a day late. The good news is that the issue is almost done. The other thing that suffered a bit this last month, especially toward the end, was the Frontier Timeline posts on Twitter. There were a few days that I was so busy that posting the event (or two) for those days completely slipped my mind and they didn’t get posted until the next day. The summary post with all the events from the last month will be coming out tomorrow along with the updated comprehensive document (which is starting to get quite large. This month saw the beginning of the end in the the Saurian sector of space as the sathar begin their final push to eliminate the Saurians. The end of April will mark the first full year of my blog. I’m amazed it’s been that long already and I’m very grateful to all my readers and supporters. Toward the end of the month or possibly in early May I’ll do a “year in review” post. The exact timing is a little uncertain as I’ll be traveling during that time frame. Early May is my 25th wedding anniversary and my wife and I will be gone starting in late April on a two week vacation including a 7 day cruise where I will have little to no internet access. So we’ll see what I can get queued up before I leave. While not directly related to the blog, April will see the publication of issue 24 of the Frontier Explorer. I’ll be sure to post a link here when it is available. As I already mentioned, tomorrow will see the next Detailed Frontier Timeline post. Beyond that I’m not really sure what the month will bring. I think that regardless of how far I get, I’ll be posting at least the sketches of the Pursale ship as that will give me some incentive to get back to that project. I also have some setting “fluff” pieces that have been on my mind for a while that I might flesh out and publish. On the starship construction system, I now think I have everything I need to have it work as a replacement for the standard system in Star Frontiers. There are some other tweaks I want to make to the system but it is otherwise good to go. I think I’ll start publishing the details specs for a number of standard ships from the game in the new system as I work on cleaning up the write-up of the system. I also think that I now have everything for the Death at Rosegard adventure as well and it’s time for me to fully write that up. I’m sure I’ll discover lots of little bits and pieces I’ve left off as I go so that may take some time to finish. 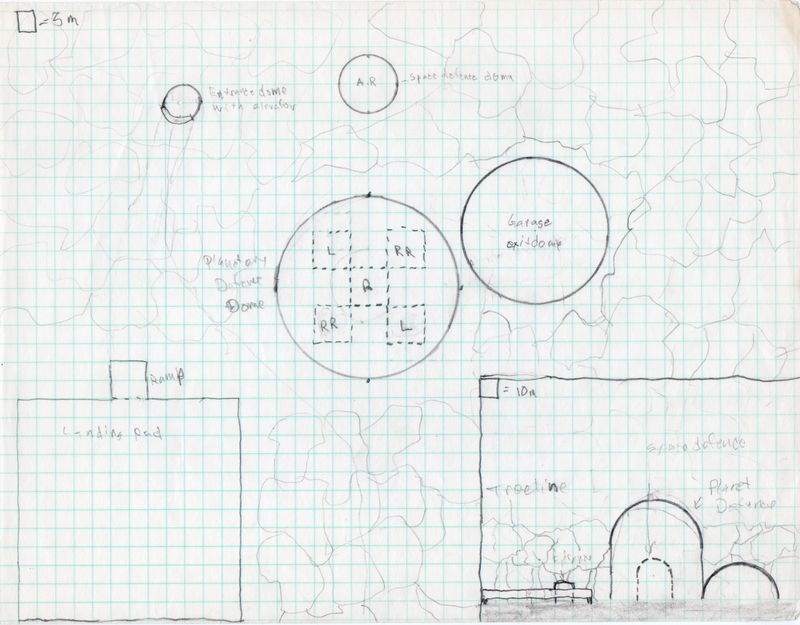 The other thing I’ve been thinking about is designing one or more small, introductory adventures for Star Frontiers. Something that can take someone completely unfamiliar with the game and walk them through the basic game mechanics. I’m thinking at least two small adventures: the first a solo introductory adventure for someone completely new to the game, and the second a simple adventure that can be used to introduce others to the core of the game. The idea is still percolating in my brain but the beginnings might happen this month. We’ll just have to wait and see. Once again thank you to everyone reading the blog and especially to those supporting me on Patron. I really appreciate the feedback and support you provide. This post is a result of me thinking about the smaller ships: shuttles, fighters, even assault scouts. But especially the tiny hull size one and two ships. We’re going to look at an expansion of the engine size chart presented in part 2, adding in some new sizes and more data on the existing engines. The first thing I was contemplating, and that I’ve know for a while, is that the Class A engines were way overpowered for the very small craft. If you took the stats for a fighter, it comes out to a total mass of about 263 tons. The thrust for a Class A Atomic or Chemical drive is 6250 and an Ion drive has a thrust of 3000. That mean the maximum potential ADF is 23.7 for the atomic and chemical drives and 11.4 for the ion drive. Well over the 6 ADF maximum and the 5 ADF specified for the ships. These smaller ships could easily get by with much smaller engines and still have the same performance. It had always been my intention to add in the smaller engine sizes. The other issue that has been nagging at me lately is docking, specifically in bays inside a larger vessel. The system takes this into account and allocates bay sizes based on the size of the ship and includes the mass of the docked ships in the ADF calculation. Except the final sizes of the ships don’t include size or mass of the engines! I had originally hand-waved that away saying that the engines were rated to propel themselves plus provide X amount of thrust depending on the size and type of engine. For the larger ships, that’s fine. The engines are external to the ship and it’s really not going to dock inside anything else. But for the little ships, this is an issue and I need mass and volume values to make it all work out. So that’s the task for today: Calculate the data for some smaller engines for the little ships, and come up with mass and volume values for all the engine types. And then we can properly build and design assault carriers to hold our fighters (and maybe our assault scouts) and any ship that has one or more shuttles it houses internally. So let’s get started. This is actually the easy part. I intended to make two additional sizes of engines, one about half the performance of the Class A engine, and a second one at half the performance of that. The hardest bit for me was coming up with a nomenclature. Do I go with the engine size labels from model rocketry (1/2A, 1/4A) to match the A, B, and C sizes of model rockets? Or do I go the battery route and call them AA, and AAA engines. In the end, I decided to go the battery route. So the Class AA engine has about half the performance of the Class A engine, and the Class AAA engine about 1/4 the performance. The only real constraint I had was that I wanted at Class AAA engine to still provide and ADF of 5 to the standard UPF fighter. Since that fighter has a mass of 274 tons (when configure, it has to provide a thrust of at least 1370. The thrust ratios between the Class A, B, & C engines are on the order of 3-4. If I maintained that same ratio, then our AA engine at best would only have a thrust rating of 6250/9 = 694, about 700 which is too small. Of course 2 of them would give us the required thrust but all the depictions of the smaller ships are single-engined and I wanted to go with that. So instead of going down by thirds, decided to go down by halves. Actually a little more in the case of the step from Class A to Class AA with the atomic and chemical drives. With that decision made, it was time to work out the values. That gives us the following table. The values for the Class A engines are simply taken from the original post and provided for comparison. Additionally, we need the cost of fuel for each of these new engines types. As with the larger engines, the atomic engines require the atomic fuel pellet at the prices listed plus a load of Chemical fuel as well. Unlike the larger atomic engines, which can hold more than a single fuel load, the AA and AAA atomic engines can only hold a single load. Additionally, the smaller ion engines can only hold 5,000 fuel units instead of 10,000 like their full-sized siblings. Now for the harder part. Generating volumes and masses for these various engines. There really isn’t much go to on here. I could look at the miniatures, but they were created more for style than with any eye for consistency between the ships. There are also a few drawing in the game books that might be used as a reference. In the end, I did the following. I started with my 3D model of the assault scout which is based on the drawings of the ship all through the books. I then assumed that this plus the wing of the assault scout represented the volume of the engine plus the fuel tanks needed to hold the three units of fuel for the engine. This gave me a volume, based on my models of 657 cubic meters. We’ll round that down to 600 cubic meters and call it good. That’s the volume of a Class A atomic engine and its associated fuel tanks. Now, anyone who looks at real rockets will immediately realize that that isn’t a lot of volume for fuel. For example, the space shuttle’s external tank had a volume of just over 2000 cubic meters. And that’s enough to make one trip up, not one and back, let alone three trips. So we’re dealing with some amazing rocket propellant here (and really cheap too). But that’s okay, I’m willing to have handwavium as a fuel additive in our rockets. The next thing we need is a scaling relation for the larger (and smaller) engines. It has to account for the larger fuel load in the larger engines, And remembering that for the atomic engines, we can hold additional loads over the three in the Class A engines. At the very least, it has to scale up as the thrust scales. But I want to add a little more on top of that. At one point in the past, I had made 3D models of Class A, B, & C atomic engines. At some point when I created them, I had some rationale for why they were the size they were. I don’t remember that rationale now (and it may have been purely aesthetic), but I figured I could at least look at them and see what the relationships were. In the end I decided that the scaling for the volumes would be 1.45 times the scaling in the thrust. That would provide a baseline and then I’d adjust the numbers slightly to get nice “round” numbers (i.e. 2800 instead of 2782.5). On the smaller engines, I adjusted things up bit making the engines slightly larger to account for “minimum” sizes for some of the components and fuel tanks. 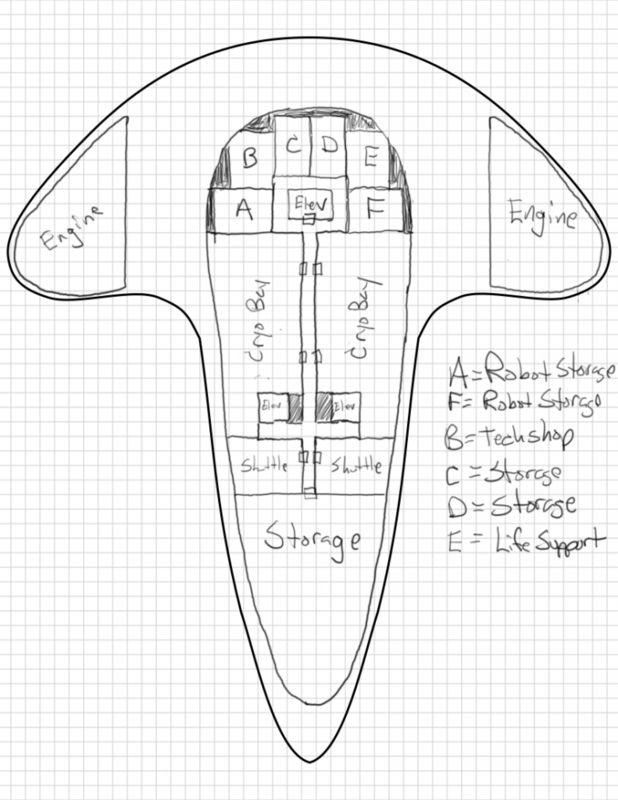 I also made some adjustments to the various types of engines to account for the type and amount of fuel they carry. This one was much easier as it was to be based off of the volume. In this case I just assumed an “average” density for each type of engine and its fuel. The question was what to pick. Modern rocket fuels are actually very light, on the order of 0.7-1.0 tons per cubic meter, less dense than water. And liquid hydrogen, the primary fuel in ion engines, is amazing light at only 0.07 tons per cubic meter. On the other hand, the actual engine parts are going to be much more dense to withstand the forces and pressures being exerted. So in the end I compromised. Chemical engines would have an average density of 2 tons/cubic meter, ion engines would be 1.5 to reflect their much lighter fuel, and atomic engines would be 2.5 to represent the additional components that give them their special properties. With all of those items figured out we can now build the full data table on each of the engine types. So how does this impact our smaller ships? Most importantly, I want to see what it does for fighters and digger shuttles, the two small ships that are explicitly included inside larger vessels. If we were to just update these vessels with the data for the original engines, the volume of the fighter would jump to 736 m3 with a mass of 1774 tons, an increase of 441% and 547% respectively. The digger shuttle isn’t quite as bad as it was bigger to begin with but it would increase to 1041 m3 and 2130 tons, increases of 62% and 60%. However, these ships don’t need this large of an engine. If its occupants could handle it, the Class A engines on the fighter give it a maximum possible ADF of 22.8. Since it is only supposed to have an ADF of 5, we can swap out the Class A engine for a Class AAA engine. It will still have a maximum ADF of 5.5. With that change, the the fighter now has a volume of 236 m3 (a 74% increase) and a mass of 524 tons (a 91% increase). Still larger, but much more reasonable and easier to pack into our assault carriers. It also reduces the cost of the fighter by 180,000 credits. Since the original cost was 528,151 cr., reducing that by 180,000 is a savings of 34%. And that makes the bean counters at Spacefleet happy. The default Class A chemical engine on the digger shuttle gives it a maximum ADF of 4.7, well within the species limit of 5. However, it only really needs an ADF of at least 2 to get on and off planets, so here we can get away with a Class AA chemical engine. This still leaves the shuttle with a max ADF of 2.3, reduces the cost of the shuttle by 22,000 cr., and put the final volume and mass at 841 m3 and 1730 tons (increases of 32% and 30% over the original), making them easier to store in the mining ships. Since the digger shuttle was original 140,320 cr., the 22,000 cr. reduction saves nearly 16% off the cost of the shuttle. And for the curious, the Assault Scout has a volume and mass of 3455 m3 and 2458 tons. Adding in its two Class A atomic engines brings its total volume up to 4655 m3 and total mass up to 5558 tons (increases of 35% and 126%). That makes it 20x larger and 11x more massive than a fighter. So it’s not unreasonable that special carriers might be designed to transport the larger ships. I definitely like the direction of this change. The size of the fuel storage is probably unreasonably small, but that’s just going to be part of the fiction of our science fiction. The exact values might change as this sees a bit more play but I think it serves as a solid baseline to build on. What are your thoughts and ideas on this update to the engines? Let me know in the comments below. With work on the next issue of the Frontier Explorer happening, it’s taking me a bit longer to get to these posts than I had hopped but progress is being made. And I haven’t yet fallen behind. Today we build the calendar system for Hum, the humma homeworld in the Fochrik system, which we have been detailing in the previous posts (part 1, part 2) in this series. Of those parameters, we won’t be using the surface gravity, radius, or orbital distance in this analysis but we will be using the rest. I ignored the moons in the early parts of this series but now they become important so we need to detail them out a little bit more. Just as the orbital period of the Earth’s moon defines the concept of a month for us, given that this is the humma homeworld, the orbital periods of Hum’s moons would probably play a roll in defining their calendar system as well. So lets figure out the data on Hum’s moons. All we really have to start with is the fact that there are three moons and their order (assuming the first one listed is the closest). Beyond that, we can really do whatever we want. That said, we have a few considerations to keep in mind. First, Hum is smaller than Earth (about the size of Venus) and so has a smaller gravitational pull. This just means that the larger the moon, the more it will cause the planet to “wobble” about their common center of gravity. So we may not want any moon to be too big. It also means that if the moons have to be too far away, they might have escaped the planet’s gravity well. This latter point shouldn’t be an issue but is something to keep in mind. Second, the moons will all mutually interact gravitationally. Which means if we have strong orbital resonances (orbital periods in small integer ratios), or if they have very close passes (with “close” depending on their relative sizes) as they orbit, the moon system may be unstable and not have survived to the present day. So while we can pick anything we want, we should keep those ideas in mind. Now ideally, after picking the parameters for the moons and their orbits, I would generate orbital data for them all and run them through several hundred thousand or several million years of orbits to confirm stability but I didn’t do that. So we’ll just hope what we come up with something that makes sense and works. The other thing to consider is what role we want to attribute to the moons in regards to the calendar system. This will have an impact on the orbital periods we pick. From here on out we’ll be calculating time in hours and using the Galactic Standard Hour (which equals one Earth hour) as the value. In truth, there is no real reason for the humma to have an hour (or minutes or seconds for that matter) that correspond to that but it as useful measure to discuss the topic. There’s only so much new information you can wrap your mind about. Kran is the innermost moon of the system. It will have the shortest orbital period of the three. As such, I decided that this moon would also be the smallest and associated with the “week” concept on Hum. Since I want the “week” to be something on the order of 5 to 10 local days, and as I have no real reason to prefer one value of another, I’ll just roll 1d6+4 to get the value. I rolled a 5 so a Hum week is 9 local days long. Since the local day is 30 hours (from Zeb’s Guide), the week is 270 hours long. I want the orbital period of Kran to be something near this value so I just rolled four d10s to refine the number. The first one, I subtracted 5 from to get a number to add or subtract from 270, and the next 3 were just read as digits to represent the first 3 digits after the decimal place. I rolled a 5 for the first die which meant no offset and then I got a 6, a 10(0), and a 4 so the orbital period of Kran is 270.604 hours. I realized later in the process that I should have probably given a bit more range the the +/- die but it’s fine as it is. We’re also going to want to have a mass for the moon as that will have a small impact on its orbital distance. Since I wanted this moon to be small but still basically spherical, I just arbitrarily picked a size that was near to the size of the asteroid Ceres. I rolled some dice to pick exact values (although now I don’t remember exactly the rationale behind what I rolled) and came up with a value of 0.0125 times the mass of the Moon. a density of 2.71 gm/cm3 for the moon. where we are solving for a. M1 is the mass of the planet, and M2 is the mass of the moon. Again I used this handy website but since you can’t actually solve for a, I had to try various distances until I got the period to match. So it might have actually been faster to do the math on my calculator but oh well. We end up with a result of 198,336.5 km as the orbital distance for Kran. For reference the diameter of Earth’s moon is 3474.2 km, almost exactly 8 times bigger, and it’s orbital distance is on average 384,400 km, so Kran is nearly twice as close. I’m not going to go over every detail of the other two moons but suffice it to say I followed the same procedure for each of those. The only constraints I had was that I wanted Gluk to be the largest of the three moons and have it’s orbital period correspond to between 1/8 to 1/14 of a year to represent the month concept. Clud was going to be way out there and orbit only about 4 times a year to correspond to the seasons. This image shows the sizes of the moons relative to each other and to Earth’s Moon. The image on the left shows their actual physical sizes if they were all side by side. The image on the right shows their apparent sizes as seen from the surface of Hum (assuming the Moon was dropped in at the proper distance). The moons are all physically smaller than the Earth’s moon by quite a bit and appear smaller in the sky. 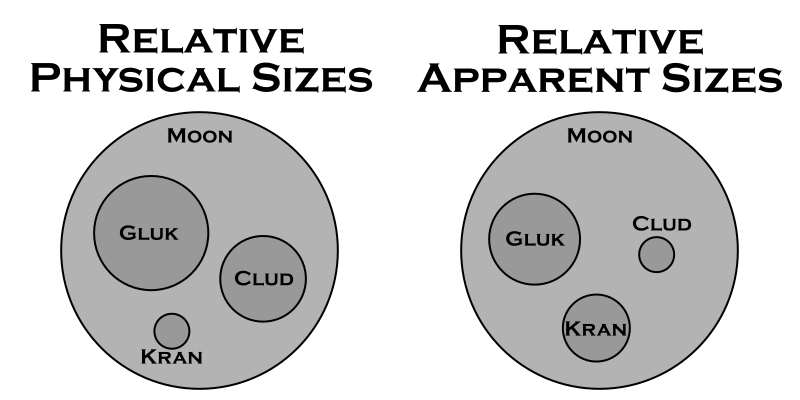 Also, notice that because Kran is so much closer than the other moons, although it is physically the smallest, it appears almost as big as Gluk and larger than Clud. One more thing we need to establish is the actual rotation period of Hum. The information in Zeb’s Guide said it was 30 hours. However, I want to add a few more decimal places but still have it round to 30. So employing my usual method, I rolled d10-6 (to get a value between -5 and +4) and then two d10s for decimal places. I then added that to 30 to get the actual rotation period in hours. I ended up with 30.09 hours. Now that we have all the physical data we need, we can get on to the actual purpose of this post, determining the calendar of the planet Hum. The first thing to determine is the length of the year in local days. We have the orbital period of the planet (11,323.3 hours – about 30% longer than an earth year and 41.5% longer than the Frontiers’ Galactic Standard Year) and the rotation period of the planet (30.09 hours) so we just divide and find that the Hum year is 376.3144 local days long. In local day terms, the year is only a bit longer than an Earth year, just 11 days more. It also tells us we’re going to need leap years, about every third year. We’ll come back to that. In the previous sections, with the exception of the moon Kran, I sort of glossed over the relationship between the orbital periods of the moons as they relate to the length of the Hum year. Now let’s look at that in detail. The inner moon Kran has an orbital period of 270.604 hours. Dividing this by the length of a day (30.09) hours, we get that Kran orbits every 8.993 days. That’s almost exactly 9 days. In fact, amazingly close to to exactly 9 days. Which is why I said above, I should have allowed for a bit more variation. You might be suspicious of how well these orbital periods line up. The exact values selected were not completely arbitrary. I picked approximate values based on what I wanted to see and then let the dice tweak them slightly. And then I also manually tuned them a bit more. For example, I actually rolled 30.06 hours as the rotational period of the planet but when working out the leap years, liked the values I got for 30.09 hours better and went with that. So it’s no coincidence that the numbers come out so close. Maybe too close. But that’s fine, sometimes you get lucky. So we’ll define a week on Hum to be 9 days long. At some point the start of first day of the week corresponds to the full Kran on the meridian but since the cycles slowly drift, that only occurs every once in a while and the phases slowly move through the week. Comparing Kran’s orbital period to the year, we see that it makes 41.84 orbits each year so a typical year is almost 42 weeks long. If we compare the orbital period of the moon Gluk to the length of day we see that it’s orbital period corresponds to 34.125 days. And comparing it to the planet’s orbital period, it makes 11.02737 orbits in a single year. Since I’m going to tie the concept of a month to the orbit of Gluck, a nominal month is 34 days long and there are 11 months in the year. There might be some variation like on Earth but this works as a base line. With eleven 34-day months, that accounts for 374 of the 376.31 days of the year, leaving 2 extra days in the calendar. I’m going to assign one of those days to one of the months making it 35 days long (in the spring) and the other will be a holiday celebrating the passing/new year and will occur at the end of summer which will be when the Hum calendar year ends. That leaves us with Clud. It’s orbit is 93.95 days long and it orbits 4.006 times each year, completing one orbit every season. Since the timing of its orbit doesn’t quite line up with the planet’s orbital period, the timing of the full phase of this moon slowly shifts (by just over half a day a year) over the centuries but the humma have tracked this for millennia and know the pattern. All that’s left is to deal with that pesky 0.3144 days left over after each year. Multiplying by 3 gives us 0.943 days, which is just enough to be considered another day. Thus every third year, the end of year holiday is a two day event instead of a single day adding an extra day on that particular year but not part of any month. It’s not quite a full day though and so every 51 years, the deviations add up enough that the extra day is not added to the calendar, just like on Earth when we don’t add in the leap day on years divisible by 100. Finally, there is one more minor correction and that occurs every 1530 years. On that year, which would normally be a year the extra day is skipped, the extra day is included (just like including the leap day here on Earth in years that are divisible by 400 as occurred in the year 2000). This has only occurred once since this calendar was established and the next one won’t occur for another 172 years. One month consists of 34 days, or nearly 4 weeks. The exception to this is the 5th month which is 35 days long. This occurs during the planting season giving one more day in that month. Every three years there is a leap day, extending the harvest holiday into a 2 day event instead of a single day. Except that every 51 years, the leap day is skipped and every 1530 years the day that would be skipped is included. One more thing we need is to anchor this calendar with the Frontier standard calendar. To do that I’m going to say that the start of Hum year 2898 will coincide with FY60.124 and that year is a leap year so the end of year celebration (that starts on FY61.290) will last two days. I realized as I was typing this up, that I didn’t account for the difference between sidereal and synodic periods for the moons. The orbital periods listed are really the synodic periods (as seen from the surface of Hum) but I treated them like the sidereal periods for computing orbital distances. Which means the distances are a bit off. The differences would be relatively small but that’s something I should revisit in the future. The rotation period for Hum is definitely the solar period (noon to noon) and not the sidereal period. Otherwise, this is a pretty good description of Hum and its moons and a reasonable calendar for the system. I didn’t touch on Forge or Larg, the two other inhabited worlds in the Fochrik system. I’m assuming this calendar predates the humma’s space age and so is the foundation of any other calendar system on the other worlds. How it was adapted might be another article in the future but for now is left as an exercise for the reader. What do you think of the calendar system presented? What would you have done differently? What do you like? Let me know in the comments below. I believe this is the last major piece of the of the Death at Rosegard adventure that I haven’t yet published so let’s get to it. In my setting, the Streele Mining corporation is the forerunner of the Streel Corporation. Hilo Headrow did a lot for survivors and refugees, during and after the occupation, and quickly rose to take control of the company. As corporate interests widened from just mining, the company was renamed. Located some 30-40 km northeast of Rosegard is an abandoned Streele Mining corporation mine. It has been abandoned since before the Great Sathar War. Sometime after the war, an enclave of sathar survivors found the mine and have set up shop. They mainly are lying very low but send out scouts into the surrounding area and are the ones that were controlling the operative at the Streel mine near Rosegard. In addition, they were in contact with Trey Mulden to do the cybernuk breeding. This map was drawn by hand on my old Samsung Galaxy Note Pro 12.2 tablet. I added the shading and the letters (but not the numbers) in Gimp for this post. In addition to the labeled locations which are described below, there is a mostly destroyed and overgrown mining complex just outside the entrance. Bits and pieces of walls and foundations still exist but there really isn’t much there. Aircar landing pad – while mainly filled with debris and rusted out vehicles from over 50 years ago when this mine was shut down, there is space for an aircar to land. The sathar have an old model aircar that may or may not currently be at the base. It was used by the sathar that was contacting the agent at Rosegard. If the PC’s captured or defeated that sathar, the aircar is not present. Pool – This is a clear water pool that the sathar sometimes use for swimming but is primarily a source of drinking water. Food Production (a) – This building contains a series of terrarium-like containers that have a variety of small bugs and other creatures growing in them. Additionally there are some hydroponic vats growing plants. None of these seem to be native to Pale. There is a single sathar working here. The sathar does not have a weapon but does have a communicator. Tech lab (b) – This building contains what appears to be a technician or robotics lab although alien in nature. What appears to be a half assembled robot sits on one worktable and other tables contain various gadgets in various states of construction. One of the items looks like a nearly complete Cybernuk headset. There are 3 sathar technicians here. Two of them are armed (laser pistol with 2 power clips) while the other has a communicator. Food Storage (c) – This is a climate controlled building with a freezer section. It contains a large numbers the creatures and plants from the food production building but preserved for storage. There is several months’ worth of food here. Supply storage (d)- This area contains a wide variety of physical and technical materials ranging from various electronic parts to tubing, to wires, to chemicals. Most of the materials look to be frontier in origin but some are definitely alien in appearance. Nuk pen (e)- This pen contains three cybernuks with no cybernetic attachments. It is locked with a level 1 lock simply to keep the nuks inside. When opened, the nuks will charge out an attack the PCs. An INT check will alert the PCs that something alive is inside. Wall and door have 100 structure points. Nuk Pen (f) – This pen contains a single nuk with the cyber attachment. It is locked with a level 1 lock to keep the nuk inside. When opened, the nuk will charge out and attack the PCs. An INT check will alert the PCs that something alive is inside. If this cybernuk is released first, the other three will start bashing against the wall and door trying to get out to come to its aid (controlled by cyber implant). Power plant and water processing – This is a geothermal power generator (type II). Cabling runs from here back to area 3 that has been partially hidden by debris and rubble on the floor. Additionally there is a large water processing facility here with fillers and processing system. Pipes run from here to areas 5, 6, 7, & 9 from here along the ceiling. There are two Sathar technician here. One of the sathar is armed (laser pistol with 2 power clips) while the other has a communicator. Small Slime Pool – This pool houses four sathar. There are small bins by the pool that hold the personal effects of the sathar that call this pool home. Each has a backpack with a food jar, a small communicator, and two of them have laser pistols with two power packs each. There are currently two sathar in the pool. Leader Slime Pool – This is the personal slime pool of the compound’s leader. This is a middle caste sathar. There is a bin here with the leader’s personal belongings which contains a backpack, a laser pistol with 4 power clips, an inertia screen with a power beltpack, two food jars, a communicator, and a small computer. The mine is not on alert for intrusion. It was fairly recently set up and does not have a lot of security features installed yet as the sathar began immediate production of the combat robots and food. One of the residents is the controller for the agent at Rosegard and possibly was captured or killed by the PC’s. If it wasn’t, add in another sathar to area 5 (small slime pool). Another is out returning from the Trey Mulden’s compound. The second sathar will arrive back 5d10x10 minutes after the PCs enter the compound. When the PCs first arrive, there are two sathar returning to area 7 from area 3 after being on duty that the PC will encounter in the passageway between those two areas when they first enter it. The next duty rotation is not scheduled to occur for another 1d5 hours at which point two of the sathar in area 6 will be headed to area 4. None of the doors, except to the nuk pens, are locked. When the PCs enter one of the buildings with sathar in it, immediately start combat. Those sathar that are armed will draw their weapon the first round but cannot fire until the second round. They will begin to attack the PCs as soon as they are able. Sathar with communicators will attempt to alert the rest of the compound. It takes them one turn to open their backpack, one turn to grab the communicator, and the third turn to send the message. The alert message will go out on the sathar’s action during the third turn. If the PCs eliminate that sathar before then, no alert goes out. Otherwise, consider the compound to be alerted going forward. When the PCs enter one of the pool areas containing the lower caste sathar, there is only a 5% chance that one of the sathar is not in the water. Regardless, the sathar will notice the PCs immediately and react. The will start exiting the pool at the rate of 1d2 sathar per round (to represent different distances from the edge of the water) starting on round 2. Once they have left the pool, it will take them one round to reach the bins and grab their backpacks unless the PCs block their way. On the round after reaching the bins, those sathar that are armed may begin firing; those with communicators will simply grab their communication device and begin to activate it. They can send an alert out as their action on their next turn (3rd after exiting the water). Sathar with communicators will engage in melee combat (two attacks per round) with their bare tentacles once the alert has been sent or immediately if the alert has already gone out. Once the alert has gone out, any sathar encountered will be ready and attack immediately upon seeing the PCs. Any sathar in the slime pools will immediate move toward area 8 where they will begin activating the combat robots at the rate of one every other turn. They will remain there until all the robots are activated. At that point they will proceed up through the cavern complex looking for the invaders. The leader will hang back sending the robots and other sathar to engage the PCs. If the PCs arrive at area 8 before all the robots are activated, the robots that are active and those sathar that are armed will engage them while the others continue to activate the remaining robots. As the robots are activated, they will be sent to engage immediately. The sathar in area 4 will take cover and immediately attack the PCs if they enter the generator and processing facility. They will get one free round of attacks on the PCs before the PCs can react. The sathar in the food processing facility will head across the cavern to the tech lab when the alert is sounded (if they are not the one sounding the alarm) and will either engage the PCs from behind if they are in the tech lab or wait with the sathar in the tech lab until the PCs or the main body of sathar arrives. The sathar in the tech lab will be waiting for the PCs if they arrive before the main body of sathar and robots. There is a 10% chance that they will have been able to reassemble the laser pistol being modified on the workbench. The sathar using it will have a 10% penalty to hit as is hasn’t been fully converted. If the PCs take a long time to get to the tech lab after the alert is sounded, raise the probability to 20%. As the sathar are under-armed, they will try to attack from cover or ambush if at all possible. If they have robots with them, they will send the robots in the fore to take damage from the PCs’ weapons. If a sathar is in danger of being captured or thinks they will die, they will attempt to close with one or more of the PCs and trigger the self-destruct in their laser pistol (if they have one). When the self-destruct goes off, treat it as a fragmentation grenade doing a number of d10 worth of damage equal to the SEU remaining in the clip. If the clip is empty it will still do 1d10 points of damage. PCs get a RS check to take half damage and intertia screens and skiensuits halve the damage as well. Here is the next installment in the detailed Frontier timeline. 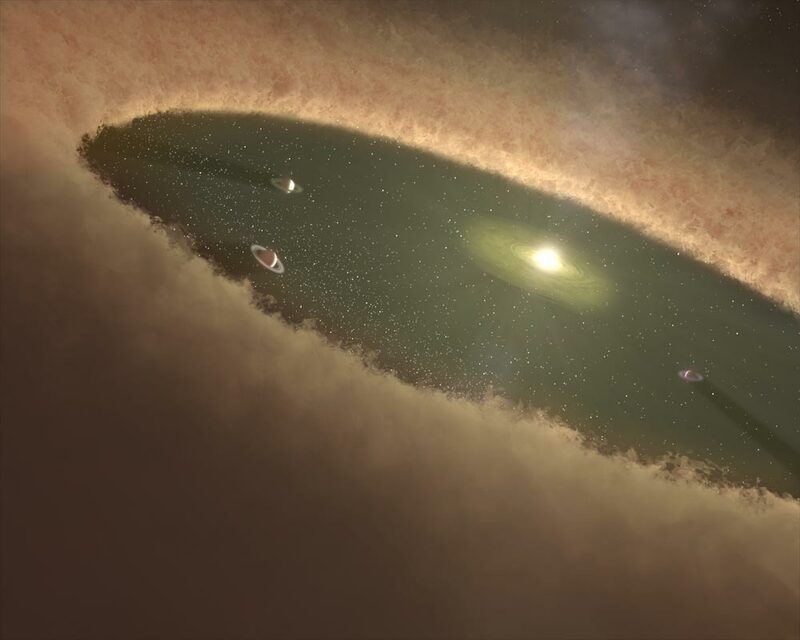 This month’s entries include the posts that prompted the “How to build a star system” posts earlier in the month. The sathar are beginning to ramp up their forces while the Frontier is still debating what to do about the “Sathar Situation” on Volturnus. 60.026 Envoy delegation from the Council of Worlds is dispatched from Gran Quivera (Prenglar) to go to Volturnus (Zebulon) to meet with the races of that world. 60.027 The KSS Trader’s Gambit arrives at Kawdl-Kit (K’tsa-Kar). 60.029 Members of the Second Volturnus Expedition raid a small outpost discovered in the logs of Slave City One that was a hideout for the Star Devil. While the Star Devil was not there, valuable information about the Star Devil’s dealings in the Frontier are uncovered. 60.030 Worried about the events in the Zebulon system, the Rim Coalition increases spending for the Flight by 50%. Delegation dispatched to the Council of Worlds from Faire (Capella) to encourage that the Frontier take the Sathar threat seriously. – Another destroyer is completed at the sathar starship construction center in the Liberty system. 60.032 Contestants, spectators, and reporters gather on Hum (Fochrik) for the annual Humma Jump Competition. Speculation is high that the current record in the standing long jump event of 38.272 meters will be surpassed this year. 60.033 Universal Households unveils its new fashion line at its annual show on Hakosoar (Scree Fron) which is transmitted via subspace radio to all systems in the Frontier. Products immediately go on sale across the Frontier as competitors race to match the new style. 60.034 After two days of competition, Zonuul Usu of Larg (Fochrik) wins the Humma Jump Competition with a jump of 38.275m, beating the previous species record by 3 millimeters. Two others beat the previous record in the final round of competition but lost to Zonuul. 60.037 Synthetics Corporation announces a new brand of sports drink that provides the necessary electrolytes for all Frontier and Rim races. Included in the line is a “Hyper Humma” variation with 10x the flavor enhancers to appeal to their deadened sense of taste. It quickly becomes a point of bravado for members of the other race to attempt to consume the “Hyper Humma” variations. 60.038 Interplanetary Industries CEO Harlon Thow spotted wearing a never before seen style of toxy-rad gauge that is slimmer and more compact than previous styles. Rumors circulate that it is a new device soon to be released by the company. 60.039 In its first 60 days of operation, the Yazira Dome has had over 1 million visitors, mostly inhabitants of Hentz (Araks). Many across the Frontier denounce the Family of One for not allowing non-yazirian visitors to the planet and the Dome. 60.040 Sathar vessels are dispatched from the Liberty system toward a staging area somewhere near the Frontier. 60.041 Sathar Clan Z vessels, previously in route to sathar starship construction center #3 are diverted by clan leaders toward Kizk-Kar. 60.042 Sathar forces, operating in Saurian(DM103) space, launch simultaneous assaults against saurian forces in the Tischen (FE004) and Dayzer (FE004) systems. 60.043 Several Streel compounds on Laco (Dixon’s Star) are captured by Galactic Task Force teams and Streel employees are forced to evacuate and return to the Streel headquarter compound in Tyrell’s Landing. 60.045 The Rim delegation arrives on Pale (Truane’s Star) for a short stopover to meet with the Pale government about the sathar situation. 60.046 Another destroyer is completed in the SCC in the Liberty system. 60.047 Pale militia delegation testifies before the Council of Worlds on Gran Quivera (Prenglar) as to the events of the Battles of Zebulon and Volturnus. Debate and deliberation on the need for increased military buildup continues. 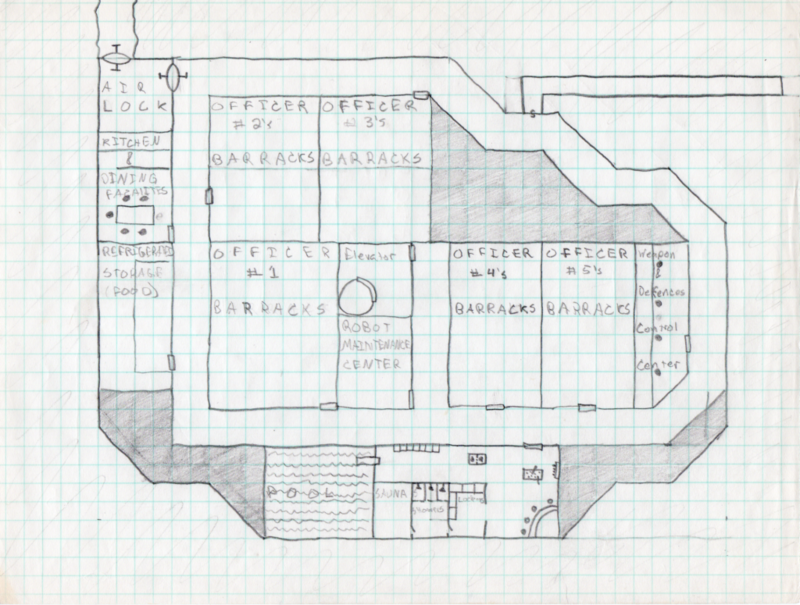 60.049 Based on information obtained from the Star Devil lair on Volturnus (Zebulon), the Pale government raids and seizes assets from several business connected with the Star Devil pirate organization. 60.051 Several PGC vessels, just arriving in the Dixon’s Star system en route to Laco are destroyed by unknown vessels. 60.052 PGC representatives appear before the Council of Worlds requesting Spacefleet aid to protect their vessels in the Dixon’s Star system from suspected Streel aggression. 60.053 Proving the rumors correct, Interplanetary Industries announces a new line of wearable monitoring devices including a new toxy-rad gauge matching the one spotted on CEO Harlon Thow several days earlier. The new line boasts extended battery life and greater accuracy in a smaller package.